India is the world’s second-largest producer of sugar. And it’s producing more than ever. In fact, India has too much sugar. The sugar glut pushed prices so low in India, the government is doing whatever it can to take supplies off the market and hopefully revive margins for Indian sugar companies. For example, India abolished its export duty on sugar. Now it’s paying subsidies to exporters. And it looks like it is going to set a price floor and then stockpile sugar like the U.S. does with its Strategic Petroleum Reserves. The situation is similar anywhere you look. Sugar’s been crushed. U.S. sugar futures dropped more than 50% in just the last 19 months. Increased production from Brazil and India have led the pressure on global sugar prices. And while global demand could increase with faster economic growth, it cannot alone be sugar’s savior. So, what might change the short-term supply outlook? Brazil, the world’s largest sugar producer, also produces sugarcane ethanol to use as an additive in gasoline. The rising price of crude oil drives up the price of gasoline. And higher gasoline prices make the ethanol business a whole lot sexier because ethanol can be added to gasoline to make a gallon of gas go further. So, Brazil is likely to shift sugar supplies toward domestic ethanol production. When it does, Brazil’s sugar exports will come down. The precise impact this will have on prices is impossible to determine, but when you combine it with bullish seasonal indicators, sugar looks like a bargain for traders. 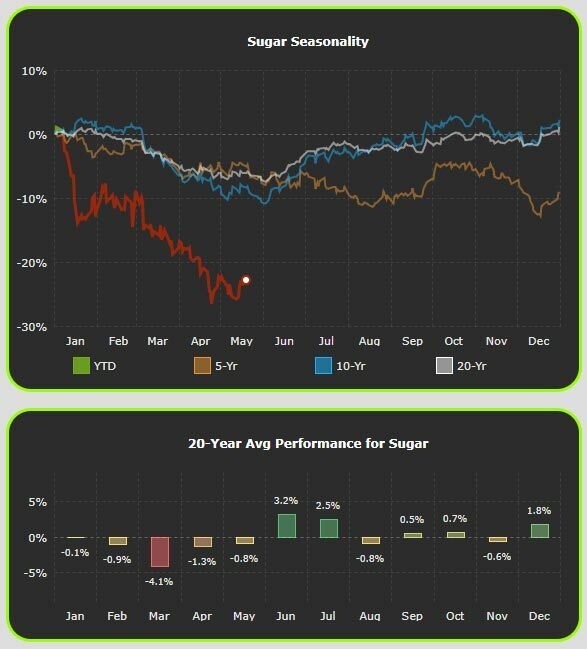 Since January, sugar has been trading way, way below its 5-, 10- and 20-year seasonal averages. But the price is stable now, and the most bullish months of the year for sugar prices are within reach. Sugar has averaged gains of 3.2% and 2.5% in June and July, respectively, over the last 20 years. Investors and traders who don’t want to mess with the futures market can use the Teucrium Sugar ETF (NYSE: CANE). In just the last couple weeks, as sugar stabilized, CANE rose more than 6%. If seasonal and fundamental forces generate a real rebound, my technical price analysis suggests CANE could rise by 30% before 2018 is over.